> Edgefx Technologies Pvt. Ltd.
Our organization is also offering General Electronics Project Kits. Our valuable clients can avail this from us at very reasonable price. 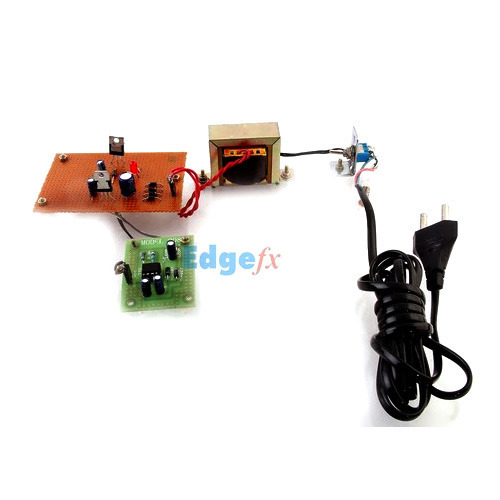 Step Up 6 Volt Dc to 10 Volt Dc Using 555 TIMER: A 555 timer is used in astable mode to deliver the output approximately twice the input voltage. The output from the 555 timer is given to a voltage doubler circuit to get the desired output. Automatic Irrigation System on Sensing Soil Moisture Content: The project is designed to operate a pump for automatic irrigation. It comprises of moisture sensing arrangement interfaced to an op-amp configured as a comparator. So when ever moisture in the soil reduces, it turns the water pump ON. This results in increase of the moisture content which in turn switches OFF the motor. The above operations are monitored by a 8051 family microcontroller. Railway Track Security by GSM with User Programable Number Features: The system detects for breakage /crack in railway tracks using line loop current break to sense the same to send interrupt to the controller to send an SMS to the station master through GSM by user programable number upon a mis-call. Wireless Electronic Notice Board by GSM with User Programable Number Features: The micro-controller receives the message from transmitter through GSM by user programmable number upon a mis-call interface, to be displayed on the LCD at user end interfaced to the micro-controller. Propeller Display of Message by virtual LEDs: Microcontroller interfaced LEDs mounted on a single column of 10 LEDs only displays programed text message virtually while rotating at high speed based upon the principle of persistence of vision of eye. Flash Flood intimation over GSM With User Programable Number Features to the station master: High water level detector interfaced to micro controller that outputs a signal to a GSM modem for sending an SMS to the station master through GSM by user programable number upon a mis-call to direct the train driver to stop the train. PC Based Electrical Load Control: Electrical appliances can be controlled through a PC interfaced to a microcontroller. This interface is done through a level shifter IC. The loads are then controlled through the relays duly interfaced to the relay driver which in turn is connected to the microcontroller. Speed Control Unit Designed for a Dc Motor: The speed of a DC motor is directly proportional to the voltage applied across its terminals. This project uses the above principle to control the speed of the motor by varying the duty cycle of the pulse applied to it (popularly known as PWM control). A micro-controller is used to deliver the PWM pulses to the motor. Long Range Fm Transmitter with Audio Modulation: A microphone is used to feed audio signals to modulate a carrier signal at a frequency of around 106 MHz. This signal is further amplified with an RF power amplifier that is connected to a tuned antenna to cover a line of sight distance of about 2 km (if we use Yagi antenna) or 20-30 Mtrs by GP/stick antenna. Automatic Wireless Health Monitoring System in Hospitals for Patients: Monitoring patient health remotely in hospitals over wireless from the patient bed to the doctor’s chamber by RF with LCD display at both ends and optionally an alarm on critical situation.